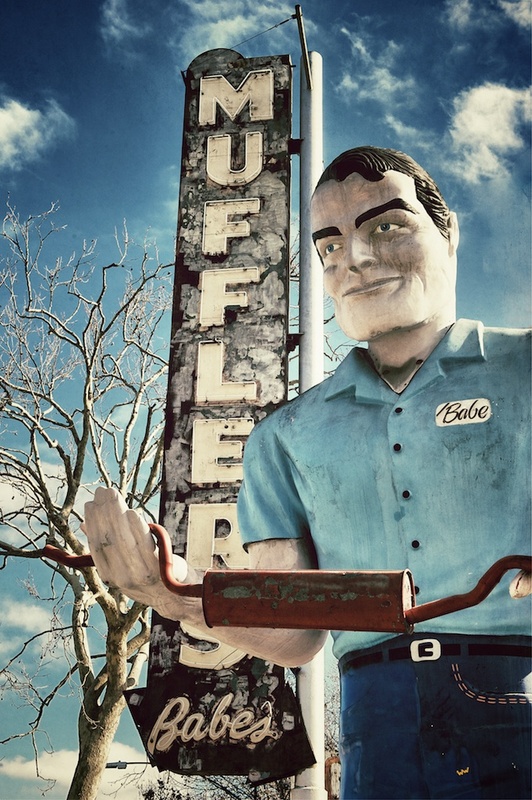 Babe the Muffler Man stands watch at Babe’s Mufflers on The Alameda in San Jose. Supposedly he’s been there since at least 1960, but the leading authority on muffler men claims the first one was made in about 1962. It was a Paul Bunyan character. The hands were arranged to hold his axe, but the clever creators realized he could be repurposed to hold lots of things. Like, say, a muffler! Great angle! I’ve even seen Babe holding a hockey stick! It looks like we’ve shot a lot of the same stuff in the South Bay… I just recently relocated from Santa Clara (lived there 28 years) to Round Rock, Texas where I get a ‘whole other country’ to shoot in my retirement.